As a DJ, there’s one gig that I always wanted to spin: Burning Man. 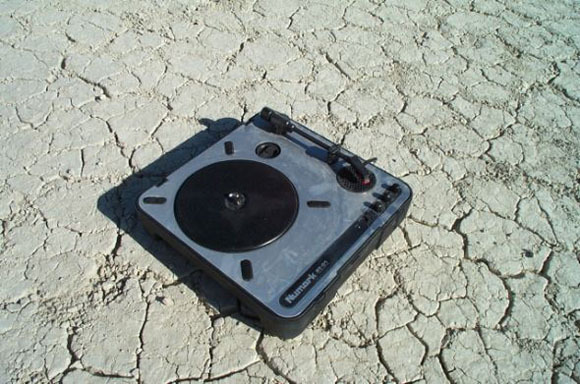 The problem is that I’m not real eager to drag my Technics SL-1210M5G turntables (which weigh 26 pounds each) to the hot and dusty Nevada desert. I found the perfect solution in Numark’s PT01 portable turntables. The Numark PT01 is a US$99, portable, battery-operated turntable that is perfect for those traveling gigs when you can’t or don’t want to bring your big and heavy DJ rig. 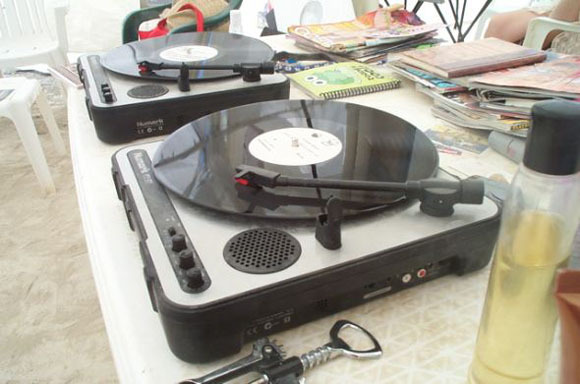 They’re also perfect for light use, resurrecting your dusty vinyl collection and for kids. The best part is that the PT01 packs up into a tiny footprint when you attach the included lid and fits in a standard record bag or crates. If you live for climbing through stacks of vinyl at used record stores or garage sales, it takes nothing to bring along a PT01 to preview a record before you buy it via in the built-in speaker. If you want to use the PT01 to spin at home or at a party, you can connect the included AC adapter and spin all night long. There’s also a full set of analog outputs for connecting it to a standard mixer and PA system. The turntable itself is no toy: the belt-drive motor operates at 33, 45, and 78 RPM and there is +/-10 percent pitch control (for beat matching). The PT-01 has tone and volume controls and 1/4 and 1/8th-inch headphone jacks. Even though it’s a belt drive platter, you can still scratch on this puppy because it comes with a high-quality slipmat built-into the 7-inch platter. Using the PT01s in the desert was a dream. The dust covers kept them clean while packed away in my tent and they were easy to grab, setup and spin due to their light weight. The sound was great, the pitch control was super-useful and the built-in cartridges saved me from near near disaster when I completely forgot to bring a set. It would be nice if the PT01’s built-in speaker was a little louder for times when you want to use it without a PA. My only other requests for the PT01s would be for a place to put the lid when not in use, it would be great it snapped onto the bottom of the turntable for safekeeping, and it lacks a place to store the AC adapter, which I’m bound to lose at the most inopportune time. Verdict: If you’re looking for a portable turntable to try-before-you-buy or to breathe new life into your long-forgotten vinyl collection, then the Numark PT01 is for you. Updated: Don’t miss the Affordable Turntable Roundup over at the always-superb Retro Thing for more options. The Numark still looks like your best bet by far for a portable turntable. Scratch for Less, Scratch Your Computer: Which is Your Turntable of Choice?